of air tankers sail back and forth over me. as thunder cells push eastward up the Kings. could have put it out anytime. 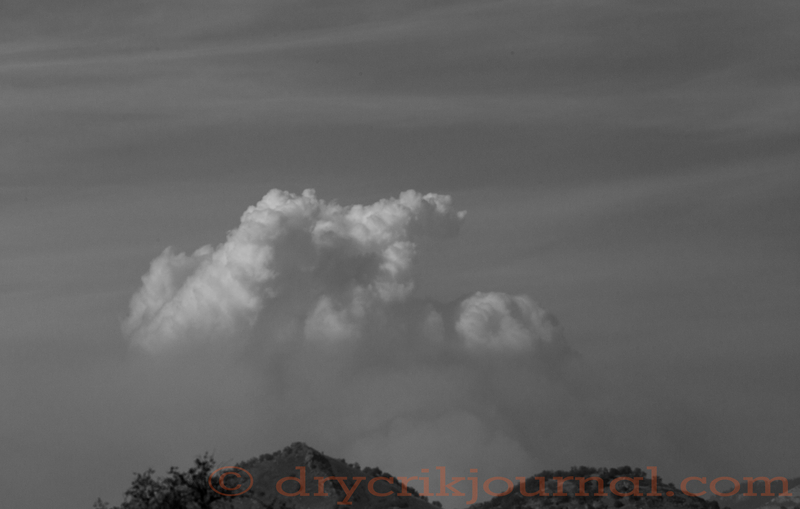 This entry was posted in Photographs, Poems 2015, Ranch Journal and tagged Rough Fire. Bookmark the permalink. Always prayers for those people. This is not an apology for the USFS, but why Smokey the Bear hesitated is because he/she did not like what they saw and tried to look at the fire from different perspectives. I think it was partially for safety reasons they did not put crews on a small fire at mid-slope with a 60% slope. I also think they underestimated their foe and treated it too long as a “resource” fire. Because it is so difficult to do prescribed fire they often take the opportunity to use a natural fire to remake the landscape into their idea of pre – European landscape. Smokey the Bear is confused and sad about what has happened with the Rough Fire, but he/she will not opologize insisting that drought and disease explain it all. I think you’ve got it absolutely right, Ben, correct and accurate. Thanks, it needed to be said.